We’d done snowshoeing with the kids before. That was when they were younger and they had an innate desire to please us. Unfortunately this desire has been shrinking bit by bit every year, now to the point where it’s best not to persuade them into coming with us, unless they want to. Consequently Kelvin and I are finding ourselves with more and more time to do our own thing. 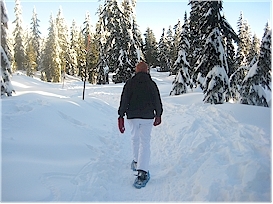 Last Sunday it was snowshoeing on Cypress Mountain. We left our home in North Vancouver at about 8:00 AM; 25 minutes later we were pulling into the Nordic Centre parking lot. That’s where the snowshoeing, tobogganing, cross-country skiing and snow-tubing all take place. When you think about it; it’s pretty amazing that we live less than half-an-hour away from 400+ cm of snow, considering on average we get less than 20 cm of snow all winter long. When we arrived (8:30ish) the parking lot was steadily filling up. Unlike the top where downhill skiing happens, parking here is free. You have a choice to either pay $6 and use the Cypress Mountain trails or pay nothing and use the trail in the northern corner of the Nordic Centre. We chose the latter. I’m assuming this trail is maintained by the park’s board because it was nicely groomed and also had flagpoles to show us the way. No lights, however, if you’re thinking of trying it at night. We wore snowshoes, but I noticed some people didn’t bother: they wore cramp-ons or plain hiking boots. We brought our own snowshoes, but you can also rent them from Cypress for $18. Ski poles are handy to have, especially when you’re going up or down the hills. Kelvin and I were about 15 minutes into the hike and I was already perspiring. I concluded that I must’ve been completely out of shape. I mentioned this to Kelvin and he said, “you say that every time, don’t you remember the first half-hour is quite steep?” It must have slipped my mind—along with, so I’m told, many other things. Thankfully the terrain becomes more undulating, which enables you to think about how pretty the snow is rather than how tired you are. After about 20 minutes we reached the cross-country skiing boundary. I should mention that cross-country skiers don’t appreciate snowshoers messing up their groomed runs. Kelvin and I made the mistake of trekking across a run, which we will never do again. After this plateau the terrain goes up and up again. We stopped after the first; the view was already spectacular. To reach the very top we needed another half-an-hour, which we didn’t have. We took a few pictures with Kelvin’s phone, which didn’t turn out very well. We attributed it to the brilliant sun. Which reminds me, you might want to wear sunglasses. I typically don’t; but I regretted not having them that day. On our way down I couldn’t help but notice how healthy everyone looked. There’s something about alpine air and exercise that brings out a rosy healthy glow in peoples’ cheeks (even mine—I checked when we got back to the car). To be honest with you, I didn’t see too many children on this hike: two three year-olds who were holding up a long line of people behind them, and a couple of 7-8 year olds who were having fun pushing each other into the snow and throwing snowballs. As soon as the novelty of the snow wore off, I remember my kids doing the same when we dragged them along. An easier hike is the one going to Hollyburn Lodge. It takes about 30 minutes and has a restaurant you can entice your kids with if they get cranky. Also, as most kids will tell you the tobogganing is a complete blast. You can’t go wrong on this one. Having said that, be sure to check out the weather conditions before you go. Adverse conditions like drizzle, fog, and wind can bring your outing to an abrupt end. By the time we reached the parking lot (11:00ish), it was packed. People were even parking along the main road leading up to the skiing area. Lesson here is, go early, especially if the weather is nice, and people haven’t dusted off their baseball gloves yet. I have to be honest with you, I was quite tired driving home. If you’re into burning calories, snowshoeing is a good workout. Unfortunately my knees were sore, probably because of the constant braking on the way down. Not enough to talk me out of going again though. Snowshoeing, it really is like a mini-vacation. Within minutes you can be in a completely different environment, relaxing, and enjoying some spectacular scenery at the same time. Please check out the website below for current rates. 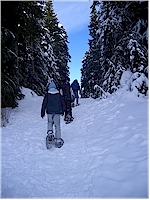 If you like hiking in the summer, you'll love snowshoeing in the winter. 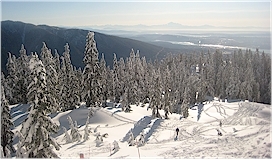 Cypress Mountain is about a 20-minute drive from downtown Vancouver. Kelvin and I are always looking for fun ways to keep the Dunlop disease (spare tire) in check: they say snowshoeing’s an exercise that burns about 500 calories an hour (and it's fun).